What determines whether an employee is full-time or part-time? How many hours per week do you need to work to be considered full-time? In the United States, the Fair Labor Standards Act (FLSA) doesn’t prescribe any legal guidelines that dictate whether or not a worker is a full-time employee. The determination of what constitutes full-time employment depends on the company's policy and practice of defining full-time employees with the exception of designations under the Affordable Care Act (Obamacare). The average person works between 38 and 39 hours per week, so how many hours a week are you expected to work if you are a full-time employee? Even though many people consider 35 or 40 hours a week full-time, the number of hours you are expected to work can vary depending on your employer. In some cases, it's less; for other employers, it can be more. The standard for full-time employment was typically 40 hours a week in the past. However, many employers now consider employees as full-time when they work fewer hours (i.e., over 30 hours, 35 hours, or 37.5 hours). Because there are no laws regulating full-time employment for compensation and benefits purposes, the organization determines how many hours per week are considered full-time. 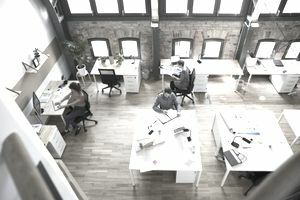 Full-time employees are often more likely to be provided with benefits, including a pension, health insurance, paid vacation, and sick time, which are not offered to part-time employees. However, there are no requirements for employers to provide benefits to employees other than those mandated by law. In some cases, employers also provide benefits to part-timers. When you are hired, you should be advised as to your employment status and eligibility for company-provided benefits based on whether you are full-time or part-time. If your status changes, you should also be informed by your manager or human resources department. Some employers have adjusted the structure of jobs and allocated more positions requiring less than 30 hours per week to avoid the burden of paying benefits. The percentage of jobs that were part-time in 1968 was only 13.5 percent and has currently risen to 18.5 percent of the workforce. Historical data also indicates that employers offer fewer full-time and a greater number of part-time positions during recessionary periods. Women were twice as likely as men to be classified as part-time. About 26 percent of women 16 years old and older versus 13 percent of men in the same age group worked part-time. With the introduction of the Affordable Care Act (Obamacare), a definition of a full-time employee has been prescribed as a worker who spends an average of 30 or more hours per week on the job. Employers with 50 or more employees are required to offer health care to full-time employees under the Affordable Care Act. Organizations can choose a historical period of three to 12 months to assign a full-time status to workers if they averaged 30 or more hours during that period of time. Once designated as full-time, employers must keep workers in that status for at least six months. There is no universally accepted, or government set, definition for full-time employment. Individual employers are free to set standards for their workforce. There are a few exceptions whereby states set a maximum number of hours that can be worked in specific occupations like healthcare. In those cases, full-time employment must fall at or below those maximums. The Fair Labor Standards Act dictates that employers must pay non-exempt employees time and one-half for any hours worked above 40 per week. An exempt employee paid a salary is not entitled to overtime pay for hours worked beyond 40 during a work week. Company policy determines the hours that employees are expected to work. The company may specify a set number of hours and, optionally, what your work schedule will be. For example, your employee handbook may specify 9 am to 6 pm, or simply state 45 hours per week. Official employer designations regarding full-time employment generally range from 35 to 45 hours, with 40 hours being by far the most common standard. Some companies consider 50 hours a week full-time for exempt employees. In some cases, especially at a start-up, it can be whatever number of hours it takes to get the job done. The company may not set a standard schedule or number of hours that employees are expected to work. Informal expectations for staff can differ markedly from the minimum hours required to be classified as full-time at an organization. If the type of work schedule hasn't been clarified when you are interviewing for a job, carefully investigate what is expected to be considered a top-performing employee at the company if you have concerns about maintaining a balanced lifestyle. Ask about the hours you will be expected to work when you have a job offer in hand. Before you accept the offer, be sure that you can commit to the number of hours per week you will be expected to work. You’ll also want to know if your pay changes for working overtime hours.